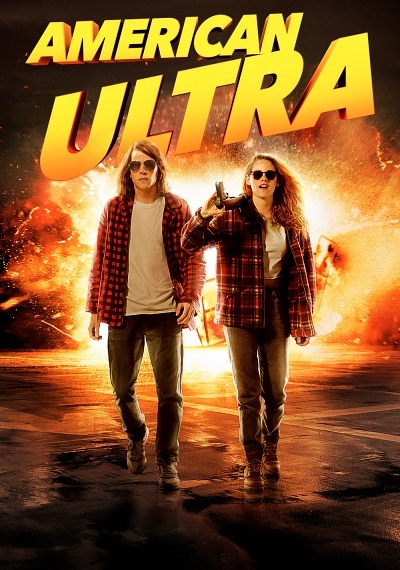 American Ultra :: Movie Information :: RabbitTV GO! Mike Howell (Jesse Eisenberg) spends most of his time getting stoned, sitting behind the register of the Cash & Carry and writing a never-to-be-published graphic novel about a superhero monkey. Someday he'd like to take his bail-bondsman girlfriend, Phoebe (Kristen Stewart), to Hawaii—if he can ever overcome the inexplicable panic attacks he experiences whenever he tries to leave the city limits. Unbeknownst to Mike, he is actually a sleeper agent created by the CIA, which has just targeted him for termination. As some of the agency's deadliest assets are unleashed upon his sleepy town, Mike's sympathetic former handler, Lasseter (Connie Britton), activates his latent skills, turning the mild-mannered slacker into a superhuman killing machine. As Mike's once-simple life becomes an adrenaline-fueled chase, no one is more surprised than he is to discover his uncanny ability to turn even an ordinary spoon into a weapon of mass destruction. With an obsessed agent (Topher Grace) hot on his heels, the newly reborn super-assassin summons his inner action-hero to try and save himself and the love of his life from complete destruction.